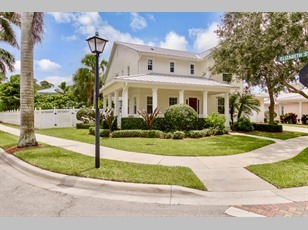 Located in Jupiter Mallory Creek at Abacoa, a Key West style community with a large fenced corner lot steps away from community pool and green area across street. Plenty of room to spread out in this 2-story home with den, family room, lots of closet space, 3 car garage and a large beautiful back yard with assorted fruit trees and plenty of room to add your private pool and deck. First floor has large guest bedroom with full bathroom while second floor has 4 bedrooms including master with private balcony. Highly rated schools for the kids.